How using your brand’s visual language can improve your site’s content. I often see clients so very excited to be able to update their website without the help of a designer or developer, only to check in on their site 6 months later to find that none of the imagery on the website follows along with the intended look and feel. Visually, it is as if they took an English-language site and started adding content in sidebars or blog posts in French and Portuguese. Just as random languages make no sense, choosing and updating images without care causes the same confusion to a site visitor. You need to present your content using a consistent visual language. In this context, visual language is the bits and pieces of design and imagery that represent your brand. If you worked with a branding agency, this is part of what they created for you. When you design collateral or a new website, you are adding to that visual language – the imagery that represents your brand is expanding. For the same reason that your written voice needs to be consistent, visitors need to know who you are, and your website is often all they have to go on when they first find you. And with 65% of Americans being visual learners, you need to put some thought into how you present yourself visually. Knowing what content is changing or being added to your site in advance gives you time to plan for what visuals you need to add. Do you need to add a slide to your home page about a sale or a holiday? Are you writing a blog post for which you need an image? Planning is half the battle. You have to invest some time. It takes time to find the right stock photo or to design a graphic that fits your branding. You are going to have to take time to make the image work with where you are putting it. Does it need to be black and white? Do you need to crop it? Does it have to have a visual element added to it? These things all take a little bit of time, but they will make sure that your graphics fit your brand’s visual language and will improve the cohesiveness of your site. You have to give yourself a chance to learn. I was not born with design skills. I have spent countless hours practicing my skills. Realize that it is going to take some time to learn how to choose images or how to edit them. You are going to want to check with others (who will give you an honest opinion) to make sure that your visuals fit in. Ask your web designer for a template for your website images. This will make sure that your images are the correct size and have any special effects in them already. Ask for a style guide that shows the fonts and colors used in your branding (or web site) so that everyone involved in the design assets for your brand has a visual guideline. If you have the budget, hire a photographer, and set up a photoshoot. If not, purchase new stock photos. 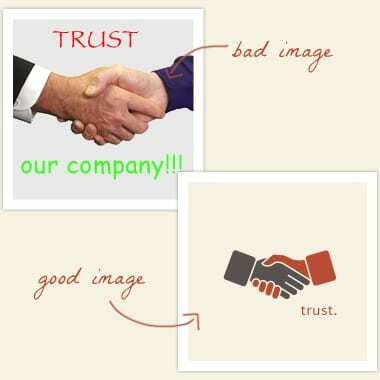 Many sites offer images for as little as a couple dollars, and by purchasing new images for new content, your images do not get dated. Use the imagery that was on your site at launch as a guide. Were the images high-contrast? Abstract/metaphorical images? Try to find images that follow the same style and feel. Do not introduce new colors or fonts in the images. It will make the image look out of place, and no matter how well-designed, it will make your site start to look amateurish if the visual language is inconsistent (see language analogy above). Pro Tip: Just because your content management tool (such as Mighty-Site, Drupal, WordPress, etc.) has a WYSIWYG editor, doesn’t mean that you should use all of the options. You don’t put ketchup on pancakes just because it is in your refrigerator, so don’t make text red and green just because you can. So much effort, why bother? Your company and your brand are important. Very important. When you don’t take care of your website, you are showing potential customers that you don’t care very much, putting your reputation for quality and consistency on the line. So please, don’t risk your brand to save a few minutes.